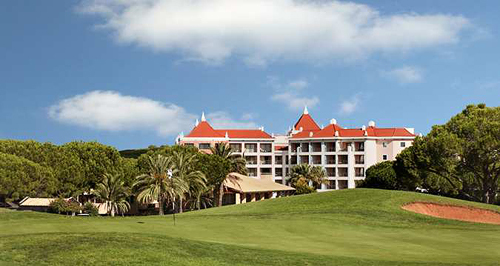 Our honeymoon at Hilton Vilamoura As Cascatas Golf Resort and Spa offers us the chance to play a round of golf. 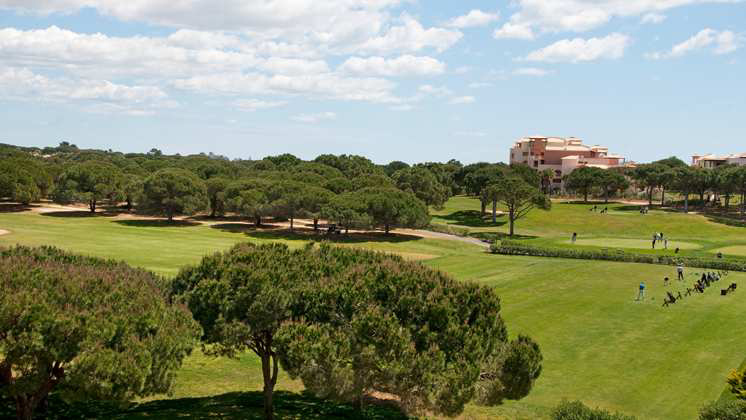 We will tee off under the warmth of the Algarve sun where we will enjoy a game at the prestigious Pinhal Golf Course. This course offers magnificent sea views and a rolling landscape of lush green fairways, and is known for its divergent, complementary styles. With your lovely wedding gift, we will enjoy an exciting, challenging round of golf while creating unforgettable honeymoon memories! Biking is a perfect adventure for our honeymoon in Vilamoura, Portugal. We will rent bicycles and set out on the trails and pathways to discover the surroundings of Vilamoura. Along the way, we will take in beautiful views, admiring every detail that our honeymoon destination has to offer! Our honeymoon will be enhanced with a stay in the King Deluxe Golf View Room. This charming room boasts fine furnishings, a work area, LCD TV, a king size Hilton Serenity Bed with luscious linen bedding, fluffy bathrobes, and an elegant marble bathroom with natural daylight, a separate bathtub and shower, and lavish amenities. 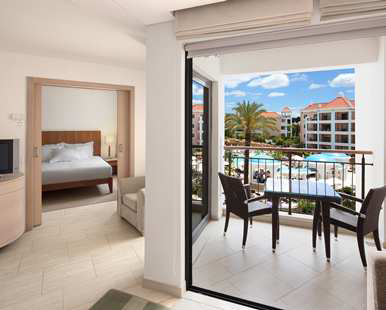 Outside on our private balcony, we will take in the lush green views of the surrounding golf course. 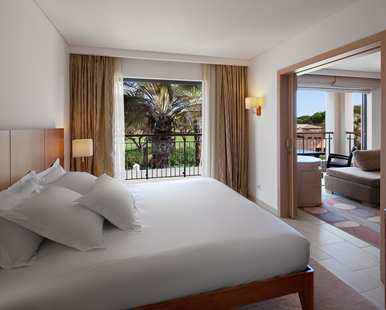 We will enjoy the stunning settings of the King Deluxe Plus Golf View Room on our romantic honeymoon. This soothing sanctuary is beautifully designed with contemporary décor and features floor-to-ceiling windows, fine furnishings in the open living area, a work area, LCD TV, a king size Hilton Serenity Bed with luscious linen bedding, fluffy bathrobes, and an elegant marble bathroom with natural daylight, a separate bathtub and walk-in shower, and lavish amenities. On our private terrace, we will take in the lush, green views of the surrounding golf course. A stay in the King Deluxe Plus Pool View Room is a wonderful wedding gift! Our romantic retreat is beautifully designed with contemporary décor and features floor-to-ceiling windows, fine furnishings in the open living area, a work area, LCD TV, a king size Hilton Serenity Bed with luscious linen bedding, fluffy bathrobes, and an elegant marble bathroom with natural daylight, a separate bathtub and walk-in shower, and lavish amenities. From our spacious terrace, we will admire refreshing views of the sparkling swimming pools, luxurious gardens and water cascades of the resort. With your lovely wedding gift, we will indulge in the enchanted settings of the King Deluxe Plus Room. Our honeymoon haven is beautifully designed with contemporary décor and features floor-to-ceiling windows, fine furnishings in the open living area, a work area, LCD TV, a king size Hilton Serenity Bed with luscious linen bedding, fluffy bathrobes, and an elegant marble bathroom with natural daylight, a separate bathtub and walk-in shower, and lavish amenities. Outside on our spacious terrace, we will take delight in the breathtaking views of Vilamoura’s beautiful city and surroundings. The King Deluxe Pool View Room promises an enchanting haven, perfect for our honeymoon! This charming, contemporary room boasts fine furnishings, a work area, LCD TV, a king size Hilton Serenity Bed with luscious linen bedding, fluffy bathrobes, and an elegant marble bathroom with natural daylight, a separate bathtub and shower, and lavish amenities. From the comfort of our balcony, we will take delight in the refreshing views of the sparkling swimming pools, luxurious gardens and water cascades of the resort. 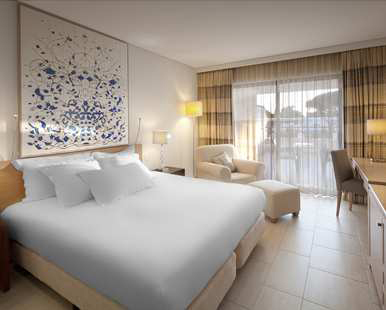 At Hilton Vilamoura As Cascatas Golf Resort and Spa, we will be pampered with a stay in the King Deluxe Room. Our charming, contemporary deluxe room features fine furnishings, a work area, LCD TV, a king size Hilton Serenity Bed with luscious linen bedding, fluffy bathrobes, and an elegant marble bathroom with natural daylight, a separate bathtub and shower, and lavish amenities. Outside on our balcony, we will make a toast to our new lives together while enjoying stunning views! On our romantic honeymoon, we will be pampered with a stay in the One Bedroom Apartment Golf View! This stunning sanctuary is beautifully designed with contemporary décor and features floor-to-ceiling windows, a well-equipped kitchen with a refrigerator, dishwasher, microwave and stove, a washing machine, fine furnishings in the living and dining areas, and a work area, LCD TV with a DVD player, a king size Hilton Serenity Bed with luscious linen bedding, fluffy bathrobes, and an elegant marble bathroom with natural daylight, a separate bathtub and walk-in shower, and lavish amenities. From our spacious balcony, we will indulge in the breathtaking views of the lush, green golf course. A stay in the One Bedroom Apartment Pool View will leave us with unforgettable honeymoon memories! Our honeymoon haven is beautifully designed with contemporary décor and features floor-to-ceiling windows, a well-equipped kitchen with a refrigerator, dishwasher, microwave and stove, a washing machine, fine furnishings in the living and dining areas, and a work area, LCD TV with a DVD player, a king size Hilton Serenity Bed with luscious linen bedding, fluffy bathrobes, and an elegant marble bathroom with natural daylight, a separate bathtub and walk-in shower, and lavish amenities. We will sit back, relax and enjoy the stunning views of the resort’s sparkling pools and lush gardens from our balcony. 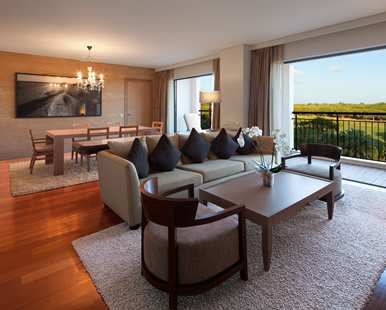 The Hilton Vilamoura As Cascatas Golf Resort and Spa promises us an exclusive stay in the King Presidential Suite on our honeymoon. This top-floor, romantic retreat is beautifully designed with contemporary décor and features fruit and mineral water, floor-to-ceiling windows, fine furnishings in the living and dining areas, and a work area, three LCD TVs with DVD players, a king size Hilton Serenity Bed with luscious linen bedding, fluffy bathrobes, and an elegant marble bathroom with natural daylight, a whirlpool bathtub, a walk-in shower, in-bath TV, and lavish amenities. We will sit back, relax and enjoy the stunning views of the resort’s sparkling pools and lush gardens from our balcony. With your wonderful wedding gift, we will listen to the sounds of the waterfalls as we sample delicacies from the Mediterranean Barbeque on our honeymoon. We will savor juicy, fresh seafood and choose from a wide range of crisp salads. For refreshment, we will sip a variety of fruit smoothies and cocktails whilst enjoying poolside views at the Hilton Vliamoura As Cascatas Golf Resort and Spa. 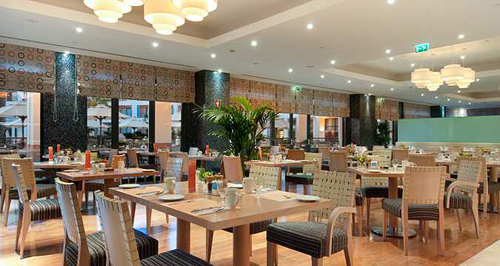 At Hilton Vilamoura As Cascatas Golf Resort and Spa, we will treat ourselves to a delicious cocktail and savor a light meal in the Club H2O. Their most famous Hilton cocktail, the Pina Colada, and tapas will ease our appetite at the beach. We won’t want to miss out on the Sunset Lounge Party every Thursday and Saturday between 6pm and 10pm with their top portfolio of Algarvian DJs. We will enjoy the sunset with a top-notch range of premium drinks at Club H2O! Together we will relax with a fresh juice in the morning sunshine and savor our breakfast on the terrace. 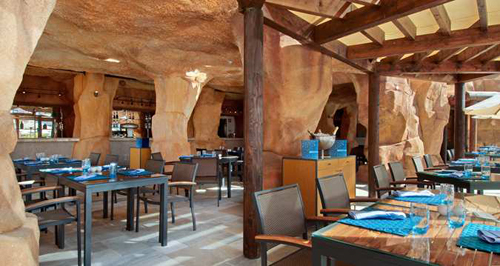 We will admire the waterfall as we enjoy both indoor and al fresco dining at Moscada on our honeymoon! 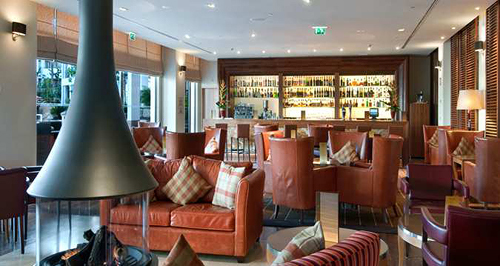 We will watch sporting events on the TV from the comfort of luxurious leather chairs in the refined Rubi Bar. In the laid-back settings, we will choose from a selection of spirits and port wines and snack on Hilton Classics, tapas or montaditos. We will sip a cocktail later as we dance the night away to live music. 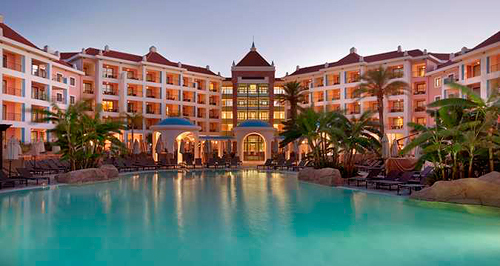 The Hilton Vilamoura As Cascatas Golf Resort and Spa promises us an enchanting sanctuary situated within five acres of landscaped gardens in Vilamoura, Portugal. This multi-award winning, contemporary Algarve hotel promises us delightful dining serving Latin American and Portugal cuisine. We will enjoy a round of our favorite drinks at the bar or make a toast in our room with a bottle of wine or champagne with room service. We will take part in a round of golf on the course or we will rent bicycles and explore our surroundings. We will browse around the gift shop for souvenirs and pamper ourselves with a luxurious treatment in the spa. On this romantic escape, we will create unforgettable honeymoon memories with this extra resort credit! 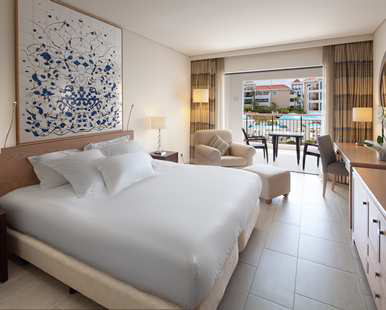 Situated within five acres of landscaped gardens in Vilamoura, Portugal, Hilton Vilamoura As Cascatas Golf Resort and Spa offers a beautiful destination setting for our honeymoon. Designed with luxuries and comforts, we will feel at home in spacious accommodations with a balcony and stunning views. We will take delight in delicious dining at the restaurants and celebrate with refreshing drinks at the bar. In the tranquil settings of the spa, we will pamper ourselves with a range of treatments, or relax on the beach that can be reached using the free shuttle. At one of the six large pools, we will take a refreshing swim or just relax with a drink in hand. If we are feeling active and adventurous, we can play a round of golf or rent bicycles. 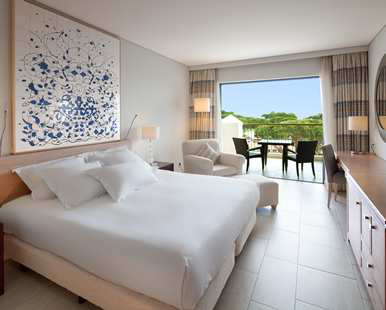 Hilton Vilamoura As Cascatas Golf Resort and Spa will enhance our honeymoon with special touches, impressive amenities and charming hospitality! On my honeymoon, I will take delight in this deep body exfoliation. In the serenity of the spa, my skin will be re-mineralized, helping regain its balance and silky softness. I will be pampered with the lavish Balinese Wrap on my romantic honeymoon. In the tranquility of the spa, I will receive this exotic wrap that is perfect for skin smoothing and softening. The Scrub and Vichy Shower treatment is a wonderful wedding gift for my honeymoon at Hilton Vilamoura As Cascatas Golf Resort and Spa. I will receive a deep cleansing body scrub, followed by a refreshing Vichy shower massage, which will revitalize and moisturize my skin. With your lovely wedding gift, I will take delight in the Radiance Facial. In the spa, I will be pampered with this facial designed for all skin types. It will purify and create a smooth and radiant complexion on my skin. 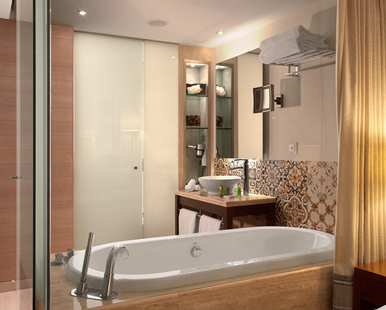 At Hilton Vilamoura As Cascatas Golf Resort and Spa, I will enjoy the soothing Herbal Bath on my honeymoon. This nourishing bath is a powerful antidote for aching muscles by using plant extracts combined with mineral rich sea salts. My honeymoon at Hilton Vilamoura As Cascatas Golf Resort and Spa offers me a delightful spa experience with the Aromatic Massage. This relaxing massage combined with the use of different blends of essential aromatic oils will leave me in a blissful state of mind! The Hot Stone Massage is the perfect wedding gift for my romantic honeymoon in Vilamoura, Portugal. The heat from the volcanic stones is used to massage my body, to ease pain and tension in my muscles and balance my mind, body and soul! I will sit back, relax and enjoy the Foot Therapy on my honeymoon in the tranquil settings of the spa. This intensive foot treatment includes a nourishing foot mask and a hydrating lower leg and foot massage. With your generous wedding gift, I will sit back, relax and be pampered with the Hand Therapy on my honeymoon. This intensive hand treatment includes a gentle exfoliation, a hydrating mask and a therapeutic arm and hand massage. We will celebrate the greatest day of our lives at Hilton Vilamoura As Cascatas Golf Resort and Spa in Vilamoura, Portugal. With your generous wedding gift, we will experience the wedding ceremony of our dreams while our family and friends gather to witness our beloved day. Our on-site wedding coordinator will take care of every single detail for our big day from our ceremony to the reception and all guest arrangements. Whether we are planning an elegant event or an intimate wedding, Hilton Vilamoura As Cascatas Golf Resort and Spa will ensure that our day is pure perfection!